On paper, The Tashkent Files must have looked like the perfect idea for a political thriller. I, for one, would love to know the truth behind the death of India's second Prime Minister, Lal Bahadur Shastri. While the official reports say it was a heart attack that led to his death in Tashkent, Uzbekistan - just hours after signing the Tashkent Agreement to end the Indo-Pak war in 1966 - but theorists say there is more to the story than what we are told. I'd love to see a brilliant movie exploring the cause of death of Shastri Ji and the political turmoil it rippled into in India. But unfortunately, Vivek Agnihotri directed The Tashkent Files is not that movie. The Tashkent Files is as far from being a sound political thriller as Bigg Boss contestants are from being unaware of the cameras. 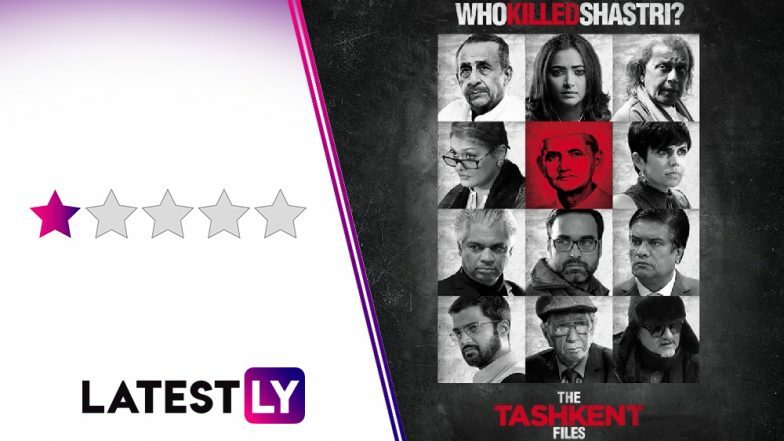 The Tashkent Files Row: After Lal Bahadur Shastri's Grandsons Send a Legal Notice, Director Vivek Agnihotri Alleges 'Top Family' in Congress Responsible for it. Let us get begin with the only two good things about The Tashkent Files. Acting and, as mentioned earlier, an idea that must have been great on paper. A round of applause for Mithun Chakraborty, Naseeruddin Shah and Shweta Basu Prasad, who gets better with every scene as if the movie was shot in chronological order. After this, everything about the movie is a disaster. The Tashkent Files is an absolute snoozefest, to begin with. It is almost impossible to believe that with so much content to roll with, a filmmaker made this dull affair. In this no-brainer, a historian says how her job is to record "facts" and, then, dismisses the importance of contents of what Shastri Ji drank right before his death in the same breath. That is just one example of just how deprived of logic everything happening in the movie is. PM Narendra Modi Biopic, The Accidental Prime Minister – 5 Movies Accused of Being Political Propaganda That You Can Expect in 2019. The story is about a journalist who is instrumental in restarting the investigation into Lal Bahadur Shastri's death. A committee of 8 people - including a political aspirant, a social worker, a historian, a scientist and the mentioned journalist - is formed to debate on the matter. Meanwhile, the journalist continues to show utter lack of common sense which includes travelling to Uzbekistan alone to meet an ex-spy, put a political witness' life in danger by meeting him without security, threatening the home minister at his house at his wedding anniversary party and what not. The scenes of arguments between the eight committee members have less logic and sense than fourteen contestants of Bigg Boss fighting on day 2 in the house. Sorry, the movie really reminded me of the reality show for some reason. There is no natural flow to the story. Contestants... I mean characters, erupt anger like a volcano with the least of intimidation. The background music is painful. A badly composed song keeps playing again and again and again and...God...again. The camera work is shoddy, especially in the outdoor scenes. The poor, illogical, boring dialogues can give a student film a run for the money. The writer and director make zero efforts to explain the character development for the journalist. What made a journalist who was happy with a 'fake news' getting 1000 retweets to care about the truth so much? When and how did she start caring for her right to know the truth so much? The character development lacks description. I am no expert at politics or history to comment on the accuracy of the 'facts' and theories shown in the film to further the plot. "Did Shastri Ji meet Subhash Chandra Bose in Tashkent?". Well, I do care but I don't know. What I do know is the movie if one of the least technically articulate movies to have come out this year. The movie is dedicated to journalists - honest and hardworking ones. And it fails to give the only journalist in the movie any trace of a brain. She is gifted with well-wishers and luck instead. She finds clues like you find coins in the back of the sofa. She exercises no caution or precaution. - Now I really want a movie in Shastri Ji. A better film, though. Skip this one at any cost. Unless badly made political thrillers are your poison.